"No ins and outs" is what I heard the security guard say as I entered the Opera House on Friday night to check out Flying Lotus' triumphant return to Toronto. That was perfectly fine with me, since I did not want to miss a single moment of musical genius that I was about to witness. As soon as I bought a beer at the bar, mymanhenri and Ultragamma started their tag team routine of hip hop jams and dubstep bangers. The two Toronto natives went back and fourth spewing out bass-heavy tracks that smashed into my skeleton and made me move involuntarily. 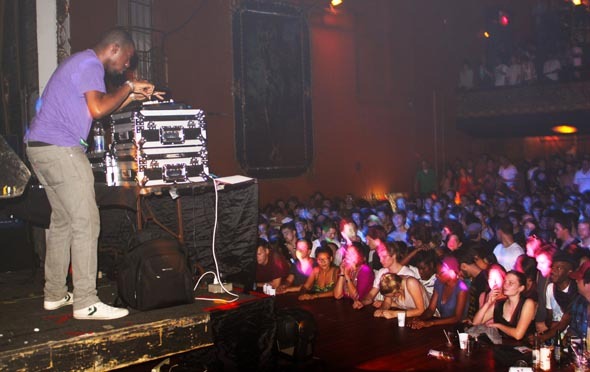 The crowd bobbed and swayed to the danceable rhythms as the two DJs "dueled" in a musical battle where the weapon of choice was a Macintosh Laptop and an MPC. 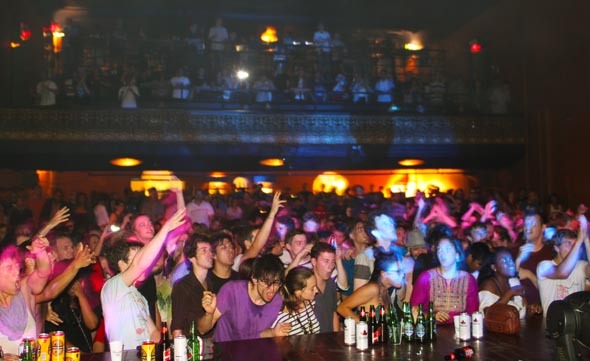 Playing classic crowd pleasers such as "Ooops" by Hudson Mohawke and "Big Pimpin'" by Jay Z, the music would only lull for a moment as Ultragamma would hype up the on-looking fans. 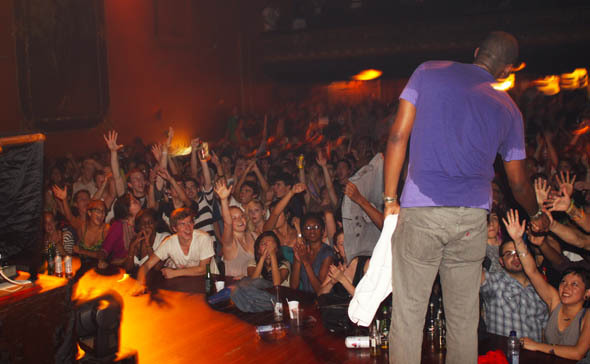 As more and more beer cans and sweaty people collected at the front of the stage, the repetition of "Flying Lotus is in the building!" ignited a roar of cheers that engulfed the baroque looking venue. Astonished eyes fell upon the dimly lit stage when Flying Lotus jogged on. He was received like musical royalty by the Toronto crowd as they bounced and screamed to the initial tones emitting from his dancing fingertips. Fly Lo continually astounds me with his musical knowledge and ability to connect songs in ways that could only be conjured up by a mad scientist. 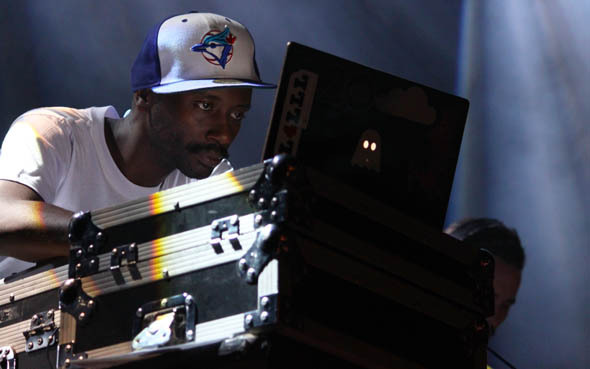 Pouring out of the pillars of speakers on either side of the stage were sounds that transcend space and time, mixed with Dilla-esque drums to kept the crowd moving. 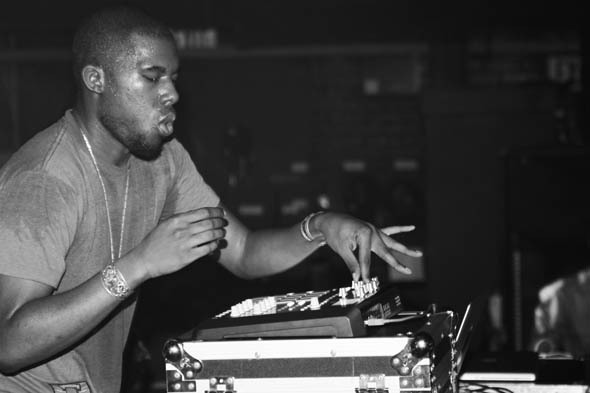 Mixing songs like "A Milli" and "Nas is Like" over Konono #1 and Radiohead showed us the true genius and prowess of Flying Lotus. 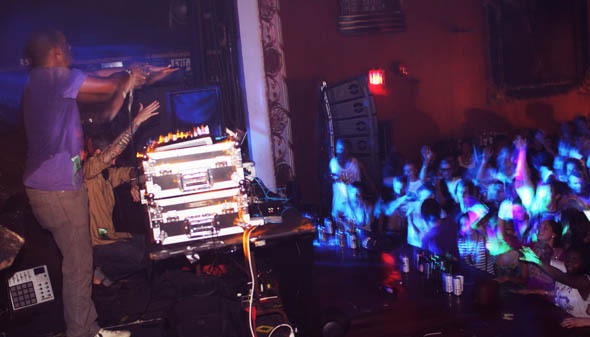 As fans continued to uncontrollably dance around the Queen East concert hall, the Los Angeles DJ transported the Opera House to a musical moon in a far off galaxy. 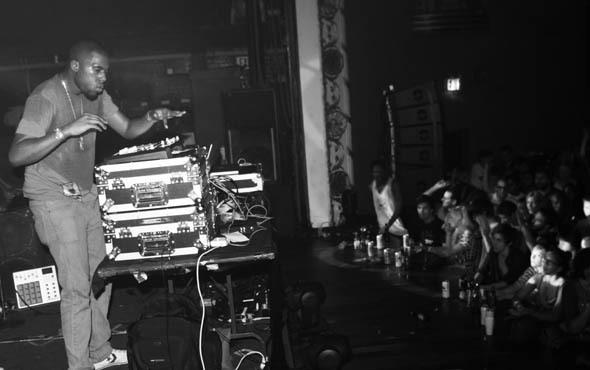 With a permanent smile plastered on his face, Flying Lotus gleefully sang along with the R&B tunes and raised his hands in the air. "Do the Astral Plane" (a track off of his new album Cosmogramma) were the only words he uttered into the mic during his hour-long set. 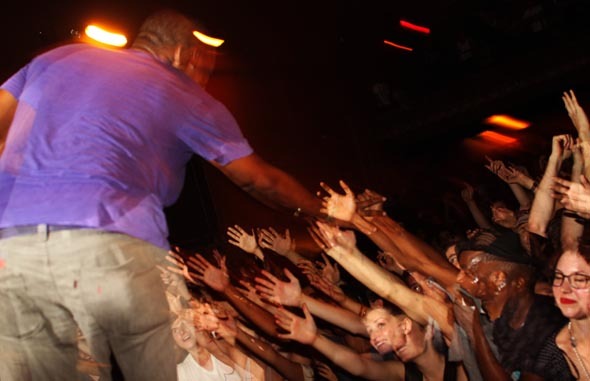 After a quick encore, he ran to the front of the stage to touch the outreached hands of his beloved fans, and just as soon as Flying Lotus landed here he soared away, leaving only memories and footprints. Photos by Matthew McAndrew. Words and video by Alex Kamino.